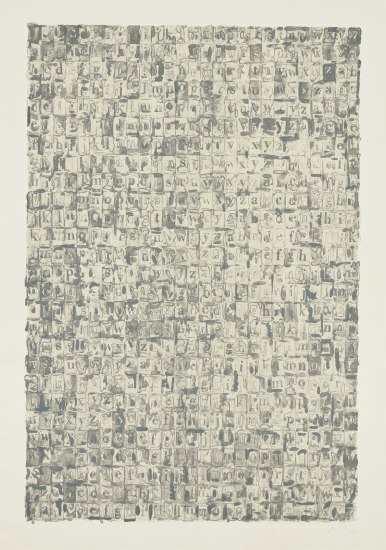 Johns played hide and seek with his imagery in Gray Alphabets through the use of transferring, overprinting and encoding as a kind of ceaseless act that merged figure with ground. Created at Gemini G.E.L. in Los Angeles, Gray Alphabets required a complex printing process of four different matrices in four different colors of gray: two warm and two cool. Johns also used water-tusche, stencils and stamps in order to capture the characteristics of a graphite wash; subtlety of hand was of absolute necessity. Forms of the Latin alphabet are a long-standing and important theme in Johns’ work. Johns sometimes regarded his paintings as models for future drawings and his drawings as explorations for works in other mediums. Two important works preceded Gray Alphabets. Before this 1968 lithograph, an encaustic and collage produced in 1956 was Johns’ early engagement with alphabet imagery. A later 1960 pencil and graphite-wash drawing explored the same imagery and was titled similarly. Upon completion, the Gray Alphabets lithograph was one of Johns’ largest prints and a great technical feat. In the printmaking studio Johns was eager to learn as much technical skill as possible, especially from master printers. One such renowned printmaker, Robert Blackburn remarked that Johns was the most demanding, the most specific and the most empirical of all the artists with whom he had worked. Johns quickly discovered how making multiples could enhance his practice and he remained fascinated by printmaking’s ability to easily retain imagery. The continuous exploration that printmaking provided appealed to Johns as an opportunity for endless discovery. Lithograph in colors, on Rives Special paper, with full margins. Signed, dated and numbered 19/59 in pencil (there were also 8 artist's proofs), published by Gemini G.E.L., Los Angeles (with their blindstamps), framed.